Before configuring AWS CLI we must sign up AWS account (if not registered yet) and you need to get access details keys. Access keys contains 'Access ID' and 'Secret Access Key' which will be using to access AWS services. 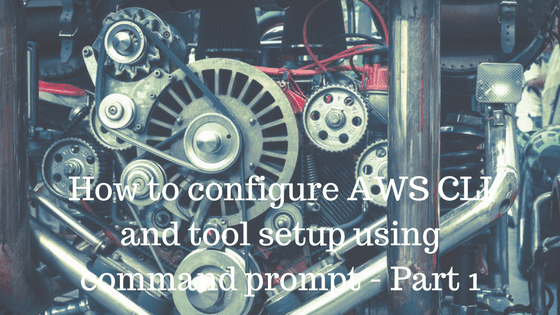 We can also create keys from AWS console management by following steps below. AWS Console Management -> Services -> IAM -> and click on IAM. IAM means Identity and Access Management which provides secure access to AWS services and resources. Now click on 'Users' menu and then click on your user. Then click on tab 'Security Credentials' here you create new access key. Click on 'Create Access Key' button to get your 'Access ID' and 'Secret Access Key'. Save this in secure place for further operations. Now we are ready to configure AWS CLI. Use command below and enter. once you press enter it will ask for AWS Access Key, enter the access key that you just created and press enter. AWS spread a crossed multiple geographical locations a crossed the world. These locations are composed of regions and availability zones. Each region has multiple location called as availability zone. Default region is the name of region which usually nearest to your business but it can any region depending on requirements. Lets set a region US East (N. Virginia) as follow. Please note if we do not set any value then default value will be None. There one more optional parameter AWS provides which is "Output Format". AWS provides three types of output formats which are. Lets see examples of formats write command below and press enter. this will display list of all running EC2 instances of your account in JSON default format. If you want to change output format the we can use commands below. AWS stored these credentials details in two files which stored on user's directory. Please note we can edit and updates these values any time by using commands above.